As Donald Trump sets off on his visit to Asia, the public has become increasingly concerned over North Korea’s capability and its willingness to use nuclear weapons against the United States. About seven-in-ten Americans (71%) say the U.S. should take North Korea’s nuclear threats “very seriously,” up from 56% in 2013. And more say North Korea is capable of reaching the U.S. with a nuclear missile – and is “really willing” to follow through on threats to use nuclear weapons against the U.S. – than did so four years ago. There are, at most, modest partisan and demographic differences in views of North Korea’s nuclear capabilities and intentions. 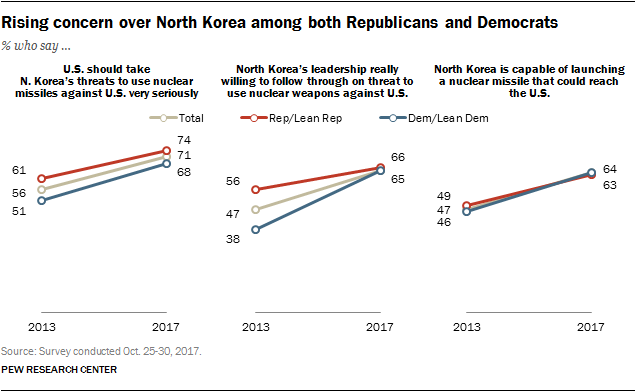 Nearly identical shares of Republicans and Republican-leaning independents (66%) and Democrats and Democratic leaners (65%) say North Korea’s leaders are really willing to follow through on its threat to use nuclear weapons against the U.S. In 2013, 56% of Republicans and just 38% of Democrats said that about North Korea’s leadership. 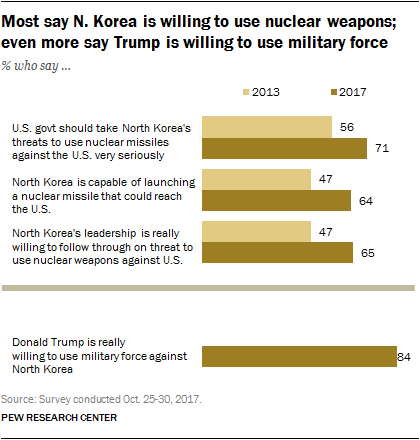 And substantial majorities in both parties – and across all demographic categories – say Donald Trump is willing to use military force against North Korea. Nearly nine-in-ten Republicans (88%) say Trump is “really willing” to use military force, as do 83% of Democrats. By contrast, there are deep partisan differences in confidence in Trump’s ability to handle the situation with North Korea. Among the public overall, 39% say they are very or somewhat confident in Trump’s handling of this situation; 13% are not too confident and 46% are not at all confident.